Everyone in Retail Management seems to understand that Conversion is HUGE….so why do I keep having to go searching for a sales associate to sell something to me? Recently, I arranged some focus group meetings, with Regional Managers, of small and medium sized chains, to answer questions about various retail topics. Before the meetings I had done some ‘shopping’ or, you may call them mystery shops, to get an idea of the way these Regional Managers were running their stores. I wasn’t in any position to judge them, nor did I want to. But, I did need to understand a bit about their perspective on retail operations. I’ve chosen two examples to tell you about today because the importance of Conversion cannot be overstated, particularly during busy times when selling steps often go out the window due to increased traffic. One Regional Manager went on, at length, singing the praises of a particular store team in his region. He said they were his highest volume store, they never missed target, they functioned like a well-oiled machine and had true team spirit. To his mind, they were, indeed, an incredible team. Well, it just so happens that my visit to that particular store was among the worst I experienced during my work on this project. The store is about 5,000 sq. feet, free standing, large front entrance with the cash desk situated quite close to the front entrance doors. They sell educational materials and toys for children. I entered the store and spent a full 15 minutes walking around the store, stopping to look at and touch 20 different items in different locations within the store. There were three staff members and 3 to 4 customers, including me, at any given time. As I approached the front of the store, just as I was passing the cash desk…clearly walking in the direction of the doors to leave…a young man at the cash desk said “hello”. I said “hello” pleasantly and kept walking. The other store used in this example was, again, touted as a fine example of the stores in a particular region. It is a women’s apparel store serving a target of 35-55 year old women. The price point is moderate. It’s an indoor, covered mall store; about 3,000 sq. feet with the cash desk situated at the very back near the fitting rooms. On the day of my shop, the store was very clean and well merchandised. It really did look amazing and I can see that plenty of customers would be drawn in. There were two staff members on duty and both were at the cash desk. I was the only customer. They did not greet me. I’m not even sure they saw me enter, although I made no attempt to sneak in. I began looking around and touching merchandise – taking a couple of items off the racks to look at. I even tried a jacket on and sought out a mirror to have a look. After 8 minutes, a sales associate approached me, greeted me and began a conversation about current promotions. We had a nice chat and then I continued looking around and, after about another 5 minutes, I left the store. I should mention, at DMSRetail, we do not advocate anyone trying to catch store personnel doing something wrong. In fact, we generally advise against surprise visits altogether. A planned visit does much more for the morale and professional development of the Manager and team. However, as a Regional/District Manager you’ve got to be on top of how your stores perform. Clearly, conversion cannot be as high as it should be in these stores in the example. Two fairly senior Regional Managers were telling me things that I knew were not completely true. They were generalising and it was surely costing them sales dollars. For the sceptics out there, we’ve seen enough to know that these were not isolated incidents. If the shoppers who are left to wander around do convert to buyers, there’s a really good chance that the amount of the sale and the number of units per transaction will not be what it could be. know what is happening. Don’t just think you know. There’s too much as stake! All Registrants will get the recording and slides. 15 facts that make social media an absolute necessity for your offline and/or online business. What exactly is a social media page? The most important step to take before building your pages. How to avoid getting lost when you are creating your page? Tips on how to create the perfect profile. Effective techniques to make your activities more productive. Step by step process to maximise your visibility. How to correctly use the 3 core posting activities that will virally spread the word quickly. Meet the marketing weapons you can utilise. Important tips that will get the most out of your Profile Settings that will boost your search engine power. Quickest and safest ways to get the followers you want. How to mimic the masters of social media. to register and make payment by credit card or PayPal. Online Marketing for Retailers…it is not as scary as it looks. Learn skills that are critical to the success of both your online and offline business. 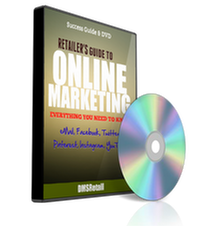 Get the know how you need to get on top of your online marketing. Join us for the webinar! No need to worry, even if you miss the webinar. Every registered attendee gets the recording and the slides!